Samsung has laid a claim to three new potential phone names, registering Galaxy Rush, Galaxy Amp and Galaxy Helm with the US Patent and Trademark Office. The three new trademarks were filed on May 21 and listed as 'mobile telephones; smartphones' so there's a good chance they're intended for phones of some kind. 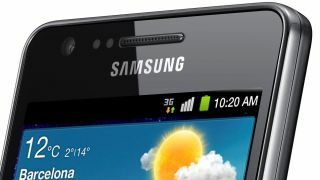 Does that mean we'll be seeing the Samsung Galaxy Rush replace the Samsung Galaxy S3? Will the Samsung Galaxy Amp be the company's Beats-beater? Can anyone really face going into a shop and asking for a Samsung Galaxy Helm? Given that Samsung usually goes for the fairly simple Galaxy Sx format for its high end smartphones, we reckon these are more likely potential choices for mid-to-low end handsets like the Galaxy Ace. But then the Galaxy Note kind of destroys that argument, so what do we know? And in any case, we'd advise you not to hold your breath for the Galaxy Rush et al – companies register possible names all the time and Samsung has filed plenty of these badboys. This particular three sound like prime double-bluffers to us, intended to shield the actual product names from prying bloggers' eyes. Tell you what though, if you're ever after the cheesiest words to pad out the lyrics of the feel good summer pop hit you're penning, we'd advise you to browse Samsung's trademark words – Samsung Solstice, Glint, Trill, Mantra, Vibrant, Impression, Equator, Blackjack, Gem, Fascinate, Mesmerise… they're all in there. Samsung Galaxy Amazing.